I just made my first steps with the uasyncio module in Micropython and I'm impressed. Here is a small example how to use coroutines for letting all 3 LEDs on the Pyboard v1.1 blink with different intervals. The resulting code is unexpectedly short but also readable. """Let the LED blink in the given interval.""" For a comprehensive tutorial on Micropython async have a look at https://github.com/peterhinch/micropython-async. One of the first IoT use cases that comes in ones mind ist measuring the temperature of your environment. An easy and cost-efficient way is to use an 1-Wire bus sensor like the DS18S20. You can get this sensor for around 2,15€ and it is really easy to implement in your µC as there are a bunch of libraries for the 1-Wire protocol. 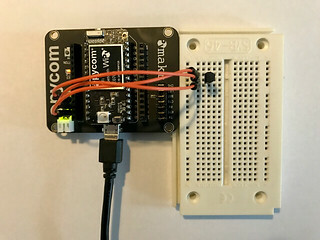 So the first thing to do is put the sensor in a bread board and connect it to your WiPy2 breakout board. The pin assignment is simple. Connect Pin1 of the sensor to GND, Pin2 to G10 and Pin3 to 3.3V. That' s it. Lately I proudly got hold of a WiPy2.0 board and this post is about how I got started with it, established a connection to my Wifi and made the WiPy to connect automatically on boot.